Rumour has it: Neil and CH: most likely will be in Australia next summer. Neil Young honors Paul McCartney at Paul’s Hollywood Walk Of Fame Ceremony on Thursday Feb 9, 2012. 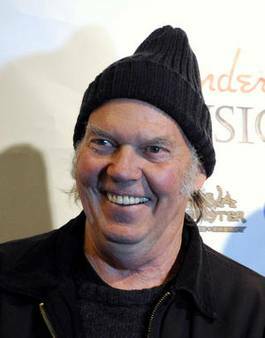 Neil Young and Crazy Horse will be present at the 2012 MusiCares Person of the Year for honoree Paul McCartney in Los Angeles on Feb. 10. “I talked to Steve about it. We were working on it,” Young said. —Legendary rocker Neil Young took his campaign for higher-fidelity digital sound to the stage of a technology conference Tuesday, saying a giant of the industry was on his side: the late Steve Jobs. Young said the Apple co-founder was such a fan of music that he didn’t use his iPod and its digitally compressed files at home. Instead, he used a physical format well-known to have better sound. Young told the “D: Dive Into Media” conference Tuesday that he spoke with Jobs about creating a format that has 20 times the fidelity of files in the most current digital formats, including MP3. device on overnight, he said. “Sleep well. Wake up in the morning. Play some real music and listen to the joy of 100 percent of the sound of music,” he said. Although Young didn’t have a practical plan for developing such a format—saying it’s for “rich people” to decide—he said Jobs was on board with the idea before he died from cancer at age 56 in October. Young’s opinion of Jobs was confirmed by interviewer Walt Mossberg, a journalist with News Corp.’s All Things D website, which hosted Jobs at its conferences. Young also said that “piracy is the new radio,” suggesting that illegally copying low-quality songs was an acceptable way for fans to sample music before buying higher-quality versions. As Ford’s chairman, Bill Ford is used to famous people ringing him up to pitch ideas. So when one of his musical heroes came calling, Ford was happy to lend an ear. Rocker Neil Young — who, by the way, once built an electrified 1959 Lincoln, only to see it heavily damaged in a 2010 warehouse blaze — wanted to talk about improving the music in cars. He wasn’t talking about singing or songwriting: he meant the sound itself. “His thesis is this — that today’s MP3 music is horrible, and that the only good music ever made was on vinyl, where you could hear each guitar string being plucked and hear as fingers moved down the frets,” said Ford, recounting the conversation. Young’s proposal: Put BluRay audio players in cars. The hitch: At current volumes, the tunes are pricey. For example, Young’s 2010 career-spanning boxed set came in three formats: BluRay audio, DVD audio and compact disc. The BluRay set stickered the highest, a wallet-shaking $350 ($250 if you snoop around online).